TireTraker™ TPMS offers systems for every aspect of the vehicle market, including RV's, Toads, Trailers, Trucks, Automobiles and Motorcycles. Our systems offer visual and audible alarms for low pressure, high pressure, and high temperature as well as rapid pressure loss. 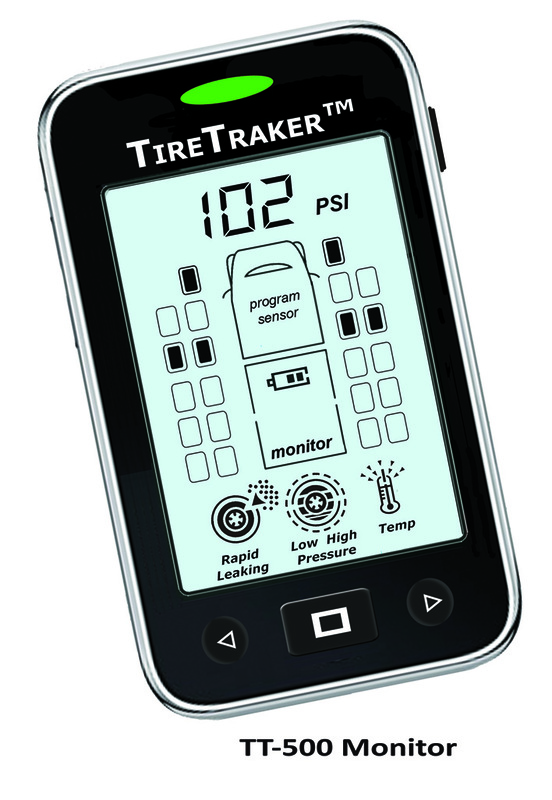 All TireTraker™ TPMS monitors are rechargeable with a battery life of up to 30 days on a single charge. Also, all of our Tire Sensors are interchangeable allowing the customer to switch options at any time. Tire Sensors have user replaceable batteries providing lower operating costs and weigh in at just 0.5 ounces, the smallest and lightest on the market. 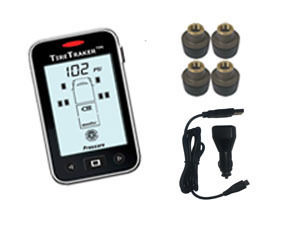 In 2015, TireTraker™ TPMS, launched the most innovative TPMS on the market today, the upgraded TireTraker™ TT-500. This system features a larger, easier to read display, continuous pressure and temperature monitoring, automatic update, automatic scrolling and the ability to monitor any tire from 0-232 psi. TireTraker™ TT-500 also offers an unprecedented "Lifetime Warranty". The number one cause of early tire failure is low pressure and the TireTraker™ systems can provide the driver in advance of possible problems and also assist in maintaining proper pressures in all vehicle tires. Although the driver can check for proper pressures while the vehicle is parked, the TireTraker™ systems can check for proper pressures while the vehicle is travelling, when most tire problems occur. Purchase one now for your RV, Toad, Truck, Trailer, Automobile or Motorcycle and travel safer and smarter. Progressive Industries understands the needs of RV'ers, and has been manufacturing Voltage Protection Units (EMS), Surge Protectors and other high quality adapters and connectors since 1998 to serve the needs of today's modern RV's. All Progressive Industries products are manufactured in the USA at their manufacturing facility in Apex, NC. Your electrical needs for your RV can range from lighting to running large appliances such as microwaves, refrigerators and air conditioners. Most RV's now have sophisticated electronic equipment that needs to operate at the correct voltage. When you plug your RV into the park pedestal, your shore power hookup may 'appear' to be OK, but it is not always what it 'appears'. 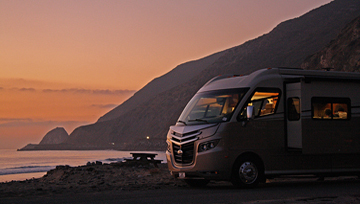 When you initially connect, Progressive Industries products will detect wiring problems immediately and prevent power from entering your RV. Once connected, low and high voltage is something that can be a very real problem. In fact, low voltage is the most common problem that RV'ers experience. That problem may not appear immediately, but it can adversely affect your appliances and electronics after continued exposure. An open or lost neutral on 50 amp service can result in severe consequences, allowing up to 240 volts to enter your RV. And, an open ground will not harm your RV, but can expose any individual to risk of electrocution. Electricity is very dangerous and can cause serious damage and/or injury. Progressive Industries understands the need to protect you and your equipment from this danger, and manufactures quality products in the USA that are designed to do this. Most Progressive Industries products also offer a "Lifetime Warranty". Customer service is #1, and 7 day per week technical support is available to their existing customers. 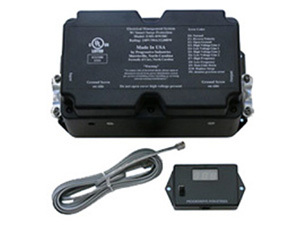 Purchase one now for your RV and travel safer and smarter. All new EMS-PTX models come with an All Weather Shield Assembly, Rugged Pull Handle, Improved Secure Locking Bracket, Built-in Scrolling Digital Display and a Tough Lexan Housing. conduct in all of our business dealings. contact us at 866-200-9773 or by email at info@rvsafety.net. Copyright © 2004-2019 RV Safety Accessories Inc. All rights reserved.